Armstrong Laminate Architectural Remnants Review | Floors, Flooring, Carpet and More! Armstrong Laminate Architectural Remnants offers diverse design with the top of the line visuals and performance in laminate flooring. In addition, Armstrong’s moisture resistant HydraCore™ Plus core provides stability and lasting durability. Armstrong Laminate Architectural Remnants collection wear resistant VisionGuard™ Commercial layer protects against spills, stains and fading. The back layer provides balance and moisture resistance. Whether you choose to create an exotic decor or a warm and homey environment, you can count on great colors, terrific textures and the look of natural hardwood flooring – Armstrong has the broadest selection of wood looks for your space. This is an Armstrong Laminate flooring with micro-beveled edges and ends. Very textural, rustic, reclaimed hardwood looks in durable, easy to install, random width planks. Installation is Lock & Fold, floating or glue down. Laminate flooring is a composition of MDF board and multiple layers of impregnated papers and Aluminum Oxide. The bottom layer is the “backing”. 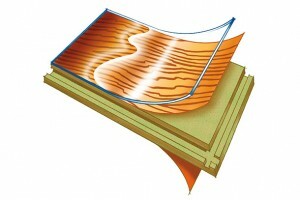 It’s designed to resist moisture that could cause boards to warp. 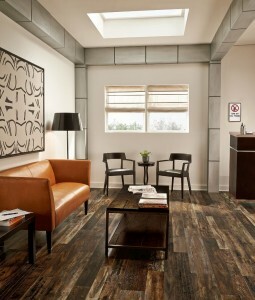 Armstrong Laminate Architectural Remnants is very quiet underfoot with Quiet Comfort Premium. Laminate is usually the preferred choice for busy homes with kids and pets. Therefore, it’s highly durable and designed for worry-free living. Furthermore with hardwood, depending on the species type and the finish, you will likely have to refinish the floor at some point to maintain its appearance. Architectural Remnants has FloorScore® certification. This is the most recognized indoor air quality (IAQ) certification standard for hard surface flooring materials, adhesives, and underlayments. Hence, it qualifies for many green building schemes. Call 1-800-548-2706 to order your flooring and take advantage of ACWG’s Terrific Prices!